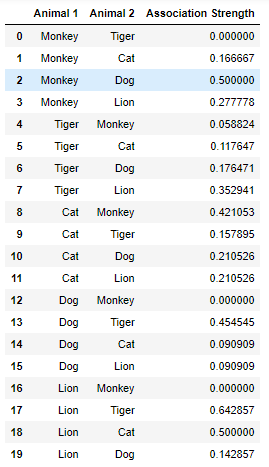 I want to find the animals' association strength, which is defined like so - if Lion and Cat appear together 5 times, and Lion's count is 10 and Cat's count is 15, then Lion -> Cat association strength is 5/10=0.5, and Cat -> Lion association strength is 5/15=0.33. The problem is, if I have a large number (say, 1000) of animals to loop on, it takes hours to finish computing the association strength table. So, how to do I better optimize this last code block, the creation/generation process of this association table? P.S. : In most practical use cases, df2 is a symmetric matrix, as "X appears together with Y" generally also means the same as "Y appears together with X". So, I am ok with solutions that assume that df2 is symmetric, and cut down the running time by half. In the above example, df2 is not a symmetric matrix, which is the more general case, and applicable for situations where we want to express meanings such as "X appears after Y" and "Y appears after X", which may not be the same. assoc_df2.columns = "Animal 1", "Animal 2", "Association Strength"
Finally, all of this only works as long as the dataframes still fit into memory, of course. Not the answer you're looking for? Browse other questions tagged python performance python-3.x statistics pandas or ask your own question.